Social workers are using several mindfulness-based approaches to teach clients to be with their anxiety, notice it, and move toward reducing it. Stop and notice. How many thoughts are cascading through your mind right now? Maybe you're trying to catch up on professional journals but can't stop thinking about a meeting you had earlier with your boss. You can't shake the sense that she was disappointed in your performance, and you're struck by the impression that she talks to you in the same dismissive way your father did when you didn't meet his expectations. Before you can think that through, it dawns on you that you forgot (again!) to defrost the roast for tonight's dinner with your husband's business partner and his wife. You'll have to stop for take-out, so you won't get home until after they've arrived. Your guests will feel awkward, your children will be cranky, and your husband will be embarrassed. No wonder that tension is moving from your shoulders up your neck. In just a moment or two, you've lost track of what you started out to do (read an article) and have spiraled into stress, self-doubt, and self-recrimination. If only you had a moment to stop the thoughts. Now, imagine how moments like this may feel to your clients with anxiety disorders. For people overwhelmed by stress and for those who suffer from anxiety disorders, the present moment may be relatively unfamiliar territory. With minds that alternately fixate on the past and ruminate about the future, they likely find the notion of living in the present an impossibility, a Catch-22. If they could remain in the moment, their symptoms might be relieved, but it's their symptoms that stand in the way of being in the present moment. Relief might be possible, they may think, if only the past and the future could no longer dominate their thoughts and trigger the symptoms of anxiety. According to experts, however, not only can they learn to "be here now," but evidence suggests doing so can significantly alleviate their anxiety. Training in these practices can also be helpful self-care practices for social workers to mitigate daily stresses and help combat compassion fatigue. The phrase "be here now" appears to have originated with Ram Dass (formerly Richard Alpert, PhD), a Harvard psychologist turned spiritual teacher whose 1971 book of the same name popularized the notion of living in the present and the practice of meditation as a pathway to authentic and joyful living. Eight years later, molecular biologist Jon Kabat-Zinn, PhD, founded the Mindfulness-Based Stress Reduction (MBSR) Clinic at the University of Massachusetts Medical School, planting the seeds of a movement similarly encouraging people to be here now. More than 200 medical centers and clinics have offered interventions based on his stress reduction model. He regularly leads workshops and retreats, has created guided meditation programs available on CDs and videos, and is the author of numerous studies and popular books, including the bestsellers Full Catastrophe Living: Using the Wisdom of Your Body and Mind to Face Stress, Pain and Illness and Wherever You Go, There You Are: Mindfulness Meditation in Everyday Life. Kabat-Zinn commonly defines mindfulness as "awareness that arises through paying attention, on purpose, in the present moment, nonjudgmentally." In his view, mindfulness is neither a goal nor a results-driven practice; nevertheless, considerable research attests to MBSR's effectiveness in helping individuals not only achieve improvements in general wellness but also manage a variety of physical and mental health concerns, chief among them stress and anxiety, with training yielding results equal to those produced by other therapeutic approaches. Kabat-Zinn's program has formed the basis for a variety of hybrid therapies that blend mindfulness with other types of therapy—for example, cognitive behavioral therapy—each of which brings demonstrated improvements. "From a theoretical perspective, mindfulness is about staying in the present moment," says Courtney Miller, MSW, LICSW, a clinical social worker in Mountlake Terrace, WA. "People who struggle with anxiety often worry about the past or the future. Staying in the present moment may alleviate some of these symptoms because people are not focused on the worries that cause anxiety." From a scientific perspective, she says, mindfulness-based approaches have been shown in several meta-analyses to reduce the symptoms of anxiety as well as other strategies, such as cognitive-based approaches. While it may be all that some patients need, mindfulness-based therapy alone can't always quell the symptoms of anxiety; some clients also will need medication. "Mindfulness often can stand on its own," Miller says, "but it depends on the person, their treatment preferences, and what their doctor recommends." When people have anxiety, "it's so painful that they do their best to avoid it," says Kate Kitchen, MSW, RSW, a private practitioner and teacher of mindfulness-based group practice at Sunnybrook Hospital in Toronto, Ontario, Canada. Thus, she says, they never get to figure out how to take care of themselves when anxiety arises. What mindfulness does, she says, is allow people to notice anxiety and sit with it, learning to realize that it's not as devastating as it feels. A client's heart rate may go up and they may have trouble catching their breath. "People with anxiety often say that the symptoms feel as bad as if they were having a heart attack," she says. They learn how to breathe into it, to notice what it feels like to breathe, and come to see that anxiety doesn't have to control them." Kitchen observes that results can come quickly, as early as the midpoint of an eight-week program. Annabella Hagen, MSW, LCSW, a private practitioner in Provo, UT, agrees. She typically uses acceptance and commitment therapy (ACT) and doesn't introduce a mindfulness component until the fourth or fifth session, but notices significant progress by the sixth session. "Once people notice their anxiety reducing," Kitchen says, "mindfulness begins to creep into their everyday lives and they find ways to apply it that even I hadn't thought of." Therapists work against the common misperceptions, even held sometimes by other therapists, that the purpose of mindfulness is relaxation and that the practice is outcome-oriented. "That might be a side benefit," Hagen says, "but it's not the purpose. It's not a Band-Aid approach for anxiety, she explains, but a lifestyle that happens to benefit people with anxiety. "It's something clients need to learn to use for the rest of their lives, not just for anxiety but [also] to learn to see their thoughts and not judge everything that's happening in the present moment." Being mindful, she adds, means you're going to "be in the present moment, be curious, and see what happens." "There are a few options for training in mindfulness-based approaches," Miller says, including MSBR, mindfulness-based cognitive therapy (MBCT), and mindful self-compassion (MSC). "These are manualized treatments, often done in group settings. They typically require attending a group, completing a teacher training, and then working under a consultant or supervisor." MSBR, devised to help manage pain, chronic health conditions, and anxiety, is an eight-week training program that includes guided instruction in mindful yoga and mindfulness meditation practices. Although there are many ways to practice meditation, each method requires the practitioner to assume a comfortable position (which might be sitting, walking, or reclining); adopt a nonjudgmental, open attitude; and use one of several methods to focus awareness, for example a mantra or attention to the physical sensations of breathing. MBCT yokes aspects of MBSR with cognitive therapy strategies to help individuals detach from negative thought processes. Developed by Zindel Segal, PhD; John Teasdale, PhD; and Mark Williams, DPhil, DSc, FMedSci, FBA, it's primarily used in the treatment of relapse of depression, but research suggests it's effective against anxiety and numerous other disorders as well. MSC, like MBSR, is an eight-week program with exercises and discussion that help participants increase self-kindness, reduce crippling self-criticism, cope with suffering and difficult emotions, enhance resilience, and integrate these skills into daily living. Research suggests that self-compassionate individuals experience less anxiety and reduced rumination. Mindfulness may be incorporated into still more therapeutic modalities for clients with anxiety. Miller observes that approaches such as ACT or dialectical behavior therapy (DBT) also incorporate mindfulness into their approaches to treating anxiety. ACT doesn't aim for clients to eliminate negative emotions but rather to change behavior in accordance with their values and in the presence of their difficult feelings. Thus, mindfulness, with its emphasis on nonjudgmental awareness, dovetails well with ACT. DBT, developed by Marsha Linehan, PhD, and originally used as an intervention for suicidal patients, merges cognitive behavioral strategies with mindfulness, which is one of four core skills emphasized in DBT, the others being distress tolerance, interpersonal effectiveness, and emotional regulation. Furthermore, Miller says, "I often use mindfulness in conjunction with eye movement desensitization and reprocessing (EMDR). In EMDR, I begin by teaching skills that increase a client's ability to stay grounded and to feel safe. It's important that clients have these skills to reground themselves if they get overwhelmed in session or to cope with memories that may arise outside of session. I will teach skills such as mindfulness of breath as a grounding practice." According to Miller, "Mindfulness-based approaches have been shown to be equally effective as cognitive-based approaches, so people may get the same results when choosing between either of these approaches." What's more, the various mindfulness-based therapies are complementary; each may offer something different, so clients may benefit from engaging in more than one type of therapy. There's fluidity among the approaches and a great deal of borrowing and melding. "Nothing is really pure anymore," Kitchen says. "You're putting together and learning from all these approaches." It's a strategy, she says, that fits with social work values. "We think about how to start where the clients are and what to use that is helpful to them. I use whatever works, incorporating what might be helpful for each individual." There's lots of research, Hagen says, "but the evidence is when you see what happens with your clients." There's no firm agreement about whether there are clients for whom mindfulness-based therapies may not be appropriate, and practitioners agree more research is needed. "I have worked with clients who have trouble tolerating body sensations that they feel in the present moment," Miller says. "Many of them have trauma histories," she adds. "Because of what they have experienced, staying in the present moment feels unsafe. Often times they are monitoring their surroundings and the actions of others in order to feel safe. If we focus on their breath or body sensations, it can increase feelings of being unsafe because they are no longer monitoring their environments. Consequently, they report increased feelings of anxiety or dissociation when doing mindfulness exercises. For these clients, mindfulness techniques are contraindicated until we work to increase their tolerance and grounding skills." Kitchen draws a line at using mindfulness with individuals who self-harm, regardless of their diagnosis. "I feel they should not be learning mindfulness until they're more stable, because in fact one's anxiety goes up before it goes down, and that would be true of whatever is making them feel so bad that they have to harm themselves to feel better." For anyone who is actively suicidal, she says, "I would want them to do other things first to help them feel safe." Hagen believes it's less black and white. Although she agrees that she wouldn't use a "be with the feeling" approach with a client who is suicidal, she wouldn't rule out mindfulness training for all clients who self-harm—for example, for teenagers who cut. Therapists, she suggests, must be client-centered and determine when and if individuals are good candidates for mindfulness-based therapy. It may not be appropriate for some clients at the beginning of therapy, she says, but eventually may be useful. Training in various mindfulness-based approaches is offered in courses and workshops in many settings, such as the Oasis Institute at Center for Mindfulness at the University of Massachusetts Medical School. Retreats, some taught by Kabat-Zinn, are also offered at the Omega Institute. "Getting trained in mindfulness-based therapy can be a commitment," Miller says. For social workers interested in learning more about mindfulness-based approaches before committing to a training process, she recommends beginning by reading the following books: The Mindful Path to Self-Compassion: Freeing Yourself from Destructive Thoughts and Emotions by Christopher Germer, PhD; The Mindful Way Through Depression: Freeing Yourself from Chronic Unhappiness by Williams, Teasdale, Segal, and Kabat-Zinn; and Self-Compassion: The Proven Power of Being Kind to Yourself, by Kristin Neff, PhD. "These books offer an introduction to a few different mindfulness-based approaches, and you can decide from there if you want to pursue further training in mindfulness." Another way to test the waters, Kitchen says, is to try to go through a group training as a participant observer: "Find someone who's teaching something and offer to help." Kitchen emphasizes that it's crucial for social workers who train clients in mindfulness to be devoted to practicing it themselves. "Even if you are not interested in using a mindfulness-based approach with clients or if you do not do direct service work, mindfulness can be a great tool for taking care of ourselves and preventing compassion fatigue," Miller says. In addition to reading books for useful practices, she advises social workers to look for mindfulness classes in their area. 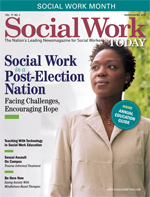 "Social workers can also benefit from learning and implementing mindfulness in their own lives. "I took a class on mindfulness self-compassion this spring, and I use the techniques frequently, especially when I struggle with making a mistake or worrying about the future."